Andigena hypoglauca Gould, 1833. This species shares the genus Andigena with three other species of mountain toucans. French: Toucan bleu; German: Blautukan; Spanish: Tucán Andino Pechigris. on nape and blue skin around eyes. Chest slaty blue; back and wings bronze-green; tail is black with red undertail-coverts. Distinctive multi-colored bill is red and black at the tip and yellow-green at the base, with two black, oval "thumbprints," one on each side of the lower bill. 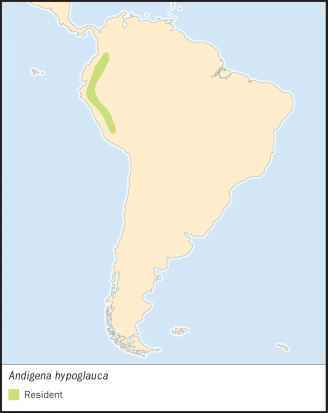 This species is restricted to the west slope of the central Andes, from central Colombia through Ecuador to southeast Peru. Usually occurs at higher elevations than all other mountain toucans. Occupies montane rainforest and elfin forest from 5,900-11,300 ft (1,800-3,450 m), but typically not lower than 7,800 ft (2,400 m), where trees are draped with moss and other epiphytes. An uncommon and secretive bird; habits are not well known. Typically stays high in the canopy. The call is a series of nasal rising pitches, repeated over and over at four- to five-second intervals. Not well known; Remsen et al. examined stomach contents of 14 specimens and found only fruit, particularly those of Ce-cropia and blackberries; no arthropods or small vertebrates. Feeds quietly, sometimes hanging upside down to reach fruits, usually foraging alone or in pairs but sometimes in small, possibly family, groups. Not much known; adults with offspring have not been reported by scientific observers. Males in breeding condition have been collected in late January and early February. Near Threatened due to rapid deforestation resulting from intensive agrarian expansion, logging, and mining. 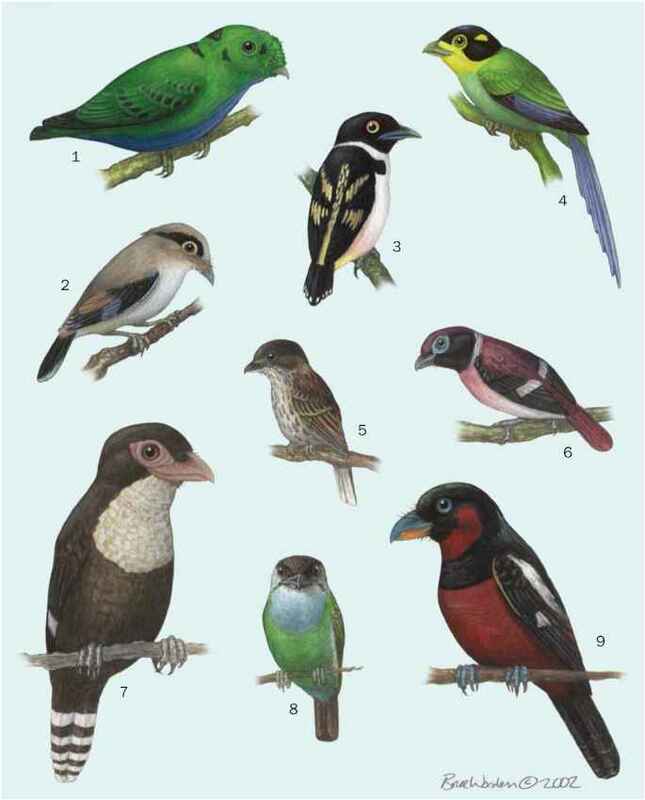 The species may also be threatened to a lesser extent by the international cage bird trade.